This is a satisfying, crunchy-edged thin crust with a golden hue from semolina and durum flours. A light hand with sauce and toppings let the taste of the dough shine through. Combine the dry ingredients, oil, and 1 cup of water in a large bowl. Mix and knead until the dough is soft and smooth (about 5 minutes at medium speed in a stand mixer). Cover and let rise for 1 to 1 1/2 hours, until puffy-looking. Toward the end of the rise time, preheat the oven with a baking stone or steel in it to 450°F. Divide the dough in half and place each on a lightly oiled 12" pizza pan or a lightly greased piece of parchment. Press the dough with your hands into a thin, flat circle 12" in diameter. If the dough starts to shrink or snap back, cover and let rest for 10 minutes before continuing. Spread lightly with sauce and the toppings of your choice, taking care not to overload the thin crust. Bake for 12 to 15 minutes, or until hot and bubbly. Remove from the oven and serve hot. 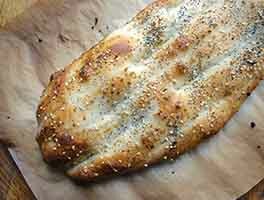 This recipe relies heavily on durum and semolina for the crust's texture, crunch, and flavor. If you don't have these flours, try our Thin Crust Pizza using Italian-Style Flour or all-purpose flour, and bookmark this semolina/durum recipe for later. Our Perfect Pizza Blend is a good substitute for the flours in this recipe. Simply use 3 cups of the blend in place of the separate flours. The crust will puff up a bit more due to the baking powder in the blend. Want to skip the puff? Try our Pasta Blend instead. Who knew pasta flour can make great pizza crust, too?! Question. My local stores sell durum semolina together in a package not seperate. Should I just use 1 1/2 cups of this? Will it affect the overall texture? Thank you. Four stars for ease of mixing up and rolling out. The crust was crisp and brown on the bottom in 12 minutes and the toppings were just right after that amount of time. My dough was thin and fairly flavorful (might add some seasoning next time), but the texture seemed wrong. We are looking for a thin, yet flexible dough. This dough was too crisp and hard and seemed to reject rather that complement the flavors of the topping. I baked it in my gas convection oven at 450, on a preheated pizza stone that I put on the floor of the oven. I did not have Durum flour as I can't seem to find it locally, but will order some from KAF. Meanwhile, is the texture that I describe the way it should be or not? Maybe the dough should rest overnight as others suggest? I would love some feedback on this, KAF! Made this yesterday and it is absolutely the best pizza crust I have ever eaten. Soft texture with thin crisp on bottom. Not as thin as I thought it was going to be. I made some up dry ingredients up and shipping it to my kids. Hi KAF. This is my first review with you. I've tried a few of your recipes, but didn't have much to say one way or the other, and I use some of your products. You may consider me a "disciple" of Cook's Illustrated, which I use for lots of things, but not all. I've tried their various pizza dough recipes and techniques, which were good, but I was just looking for something else. And this pizza dough was it! I used all three flours, added some seasoning and used KitchenAid dough hook. 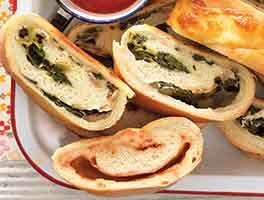 It is so easy to work with, tastes great and keeps for days in the fridge tightly wrapped. I'm able to stretch and then roll super thin. I also figured out to poke lots of fork holes to keep it nice and thin when it bakes. I used a pre-heated baking stone on the bottom rack at your temp of 450, and prepared on your parchment paper, trimmed excess, and baked on the parchment. This method does not require a parbake. The top browns nicely and the bottom is so crispy. I am so happy to have tried this. It honestly took a few attempts to get it exactly how I wanted it. The possibilities are endless. Thank you. Wow! The semolina makes such a difference. I didn't have Durham, so just added more all purpose flour. 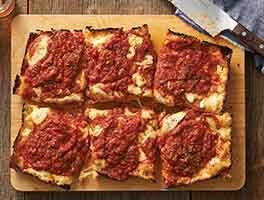 This recipe stretched out nice and thin with a crisp bite and tasty flavor. I wanted to add some flavor with some yeast extract. 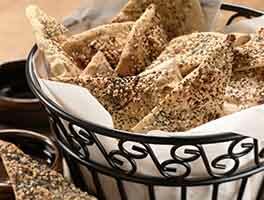 How much would you suggest per pound of flour/semolina/durum mix? Made 1/2 recipe and refrigerated for 8 hours. We loved it. 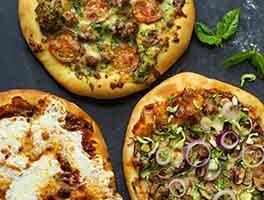 This perfect thin crust recipe is the perfect back drop for all of your creative artisan pizza creations. Love it! After collecting equipment, I finally got courage up to make a pizza dough from scratch. I tried the pizza dough mix, but we like this recipe much better. I mixed the dough in a stand mixer, 2nd speed, with the dough hook. I stopped it and scraped the bowl twice, but the hook totally mixed it in 5 minutes. What a beautiful dough!! I had fresh KAF ingredients, and let it rise in the small plastic dough rising tub. I shaped it on a parchment spritzed with oil, topped with a cooked hamburger, onions, and olives mixture, grated cheese, and baked on a preheated stone. I put half of the dough in the freezer and only baked one for two of us. So far, our favorite crust for sure.